Heat the sugar and egg whites together to 60°C in a mixing bowl over a Bain Marie. Remove from the heat and mix in the bowl of a stand mixer fitted with a whisk attachment to create a meringue. Fold through the sieved icing sugar and cornflour. Pipe the kisses shape onto the baking paper, you should have approximately 230-250. Divide the remaining meringue between 3 bowls. Add a drop of colour to each bowl and mix with a spatula. Add more colour until you achieve the desired shade. Pipe the coloured meringue onto a sheet of baking paper on a greased tray. You should have approximately 15-20 kisses in each colour (red, yellow and green). Bake in the oven at 75˚C for 2 hours. Place the cream (B) into a bowl and semi-whip it until it has some body but still collapses. Fold the semi-whipped cream through the chocolate base with a spoon until combined. Prepare a cake board and pipe some of the chocolate mousse onto the board and place the largest meringue disc (18cm) on top of the board. Pipe a swirl of mousse on top of the disc. Place a few of the halved raspberries on top of the mousse. Add another 18cm disc on top. Pipe a thin layer of mousse over the tree, in lines going from the bottom to the top of the tree. 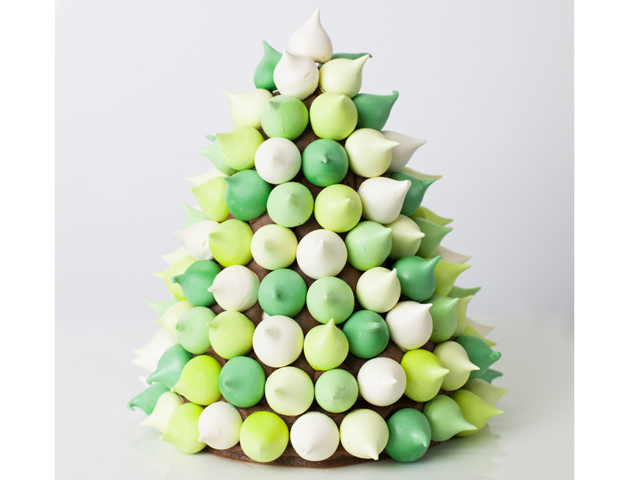 Assemble the kisses from the bottom of the tree, starting with the white and randomly adding a coloured one as you go.